under the Controlled Substances Act or the legalization of any controlled substance listed under the Controlled Substances Act. See? If you want to make sure your experts don’t come to conclusions you dislike, just prohibit them from talking about those conclusions. Then they don’t really exist. That’s the American way of science. That has changed under the New Labour government, which has also taken a number of other steps to “Americanize” British governmental practice, for example by building up the power of the Prime Minister’s office vis-a-vis the ministries, in which the ministers are famously captives of their civil-service officials. In some ways, this is a “democratizing” step, elevating the importance of the beliefs and values of elected politicians over those of unelected experts. But that doesn’t mean that those of us in the business of being, and training, experts have to like it, and insofar as expert beliefs track objective reality more closely than do voters’ prejudices, it also means making decisions with a weaker connection to the actual phenomena. 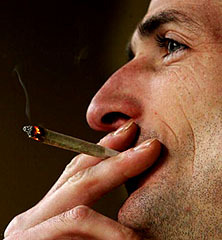 When the head of the Advisory Committee on the Misuse of Drugs gave a careful, analytic lecture arguing that cannabis and LSD were over-controlled compared to more harmful drugs such as alcohol, the Home Secretary promptly sacked him on the grounds that for a scientific advisor to express an opinion touching policy made it impossible to have confidence in the adviser’s objectivity. This is, not to put too fine a point on it, bullsh*t. What the Home Secretary clearly means is that the Government is committed to the War on Drugs and isn’t interested in any advice that might get in the way. More here on the British dustup.